We are living in an extraordinary transition and it is important to be holding one another in love and prayer. It is also important to be standing up for those who are subjects of hatred and otherwise afraid to wear a hijab, go to school and share their anxiety. In short, it is time for people of faith to come together with our elected and appointed officials to reaffirm our fundamental values and reassure our neighbors of our respect and appreciation. Our County Executive and County Council have taken the lead by unanimously passing a resolution (click here to view a copy) affirming the beliefs and best practices of our faith traditions. It also denounces anti-immigrant, racial bias, hate speech, hate crimes and harassment in Montgomery County. Read it and be grateful for the Montgomery Way and the benefits of being a majority-minority county with one-third of us foreign born. Next our County Executive has asked the faith community to take the lead and bring our people to Veterans Plaza this Sunday at 2:30. Faith leaders are asked to wear vestments and stand behind the speakers as a sign of solidarity and commitment to diversity, inclusion and respect for all. 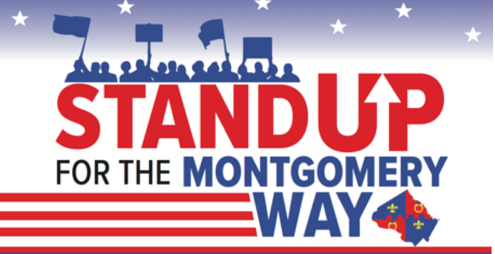 Here is the flier calling us to STAND UP FOR THE MONTGOMERY WAY. We are planning this as an intergenerational event and focusing on those in need of reassurance from our government officials and ourselves. You will find our Chief of Police and Superintendent of Schools standing with faith leaders who are partners in creating social cohesion and public safety. Kindly promote it and encourage people to make life affirming signs such as Love Overcomes Hate, Diversity is Our Strength, Ready to Love and We Shall Overcome. Looking forward to seeing you and standing up together for the sake of maintaining the Montgomery Way.